It has been a busy year, and now Spring is just around the corner which is a big relief to us all. Our Society is coming along nicely; we are now a registered Charity along with our incorporated status and a bank account, so we are now fully operational. On the 1st of August Scleroderma NZ was very busy with both a seminar held in Hamilton organised by Linda Bell, with a very interesting programme and the Wellington group held their normal August meeting with a very interesting Speaker Amanda Johnston from working Hands, a great turn out all round. Greetings to you all. 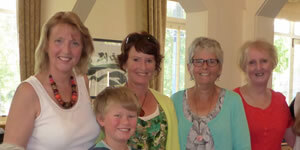 We have had a busy year so far with Scleroderma New Zealand becoming incorporated in February. Now, we have our structure in place. You don’t want half the population to suffer scleroderma just so you can hold bigger get-togethers but in Southland, Heather Milligan says a small group has grown into a slightly larger group that meets for support regularly. Conference proceedings The Foundation has disabled embedding on its YouTube proceedings. Use the link to view the videos individually on YouTube. Dianne’s big adventure You might have heard of the Mt Lowry Challenge on the Eastbourne hills on the east side of Wellington harbour. My husband Gordon and I invented our own version: “The Bus Barn Challenge,“ traversing the Eastbourne ridge to the big bus parking shed. We set out on a Sunday a couple of weeks ago. It was a toasty 25 degrees so I took plenty of extra clothes in case I got a little damp with the climb up Lowry. A support group member’s experience with scleroderma Palmerston North support group member, Catherine Thompson, has completed a series of paintings entitled “Flight Path of Disability”, representing her journey with scleroderma and her my life over the past year. It also expresses grief and loss.